This is a very similar view to Matlock Bath: Jubilee Bridge, The Promenade, 1890 and was printed by the same publisher - Francis Frith. On the extreme left is a property not often shown in the photographs of the day. Fernie Bank had been the home of the bookseller and stationer William Elliott Howe in the 1880s and Mrs Howe continued to live there for some years after his death. Fernie Bank was built in the 1860s and is constructed of red brick (not really shown here) with stone quoins. The large houses of Fountain Villas form the next two blocks and beyond them is Derwent (North) Parade. Matlock Bath's promenade is next to the River Derwent, with Jubilee Bridge providing access to the Lovers' Walks. Postcard,"Matlock Bath: Derwent Terrace". 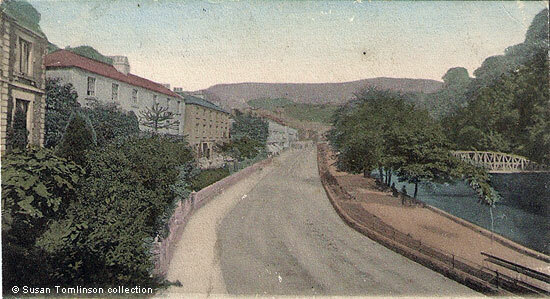 Frith Series Postcard, posted in Waremme, France in 1909. Further research shows the original black and white photograph of this card is numbered 31276 and was published by Frith's in 1892. Researched by and © Ann Andrews.